Getting rid of mosquitoes is easy once you understand the biology of a mosquito. Mosquitoes are vectors, which means they are capable of transmitting a disease and can be considered a public health nuisance. Around the world, there are more than 3,500 species of mosquitoes. Only a few of them can transmit diseases to people. Here in Los Angeles County, we’re most worried about the mosquito species dangerous to humans. That is why our district’s mission is to reduce the populations of mosquitoes to prevent or stop disease outbreaks. In addition to control, we also use mosquito traps and other tools to monitor populations of mosquitoes and the diseases they spread. All mosquitoes need stagnant, dirty water to go through their life cycles! This is because the female mosquito, after taking a blood meal, lays her eggs either on the surface or edge of the dirty water. The larva (“wriggler”) emerges from the egg and feeds on bacteria and other biological matter to grow and turn into a pupa (“tumbler”). In the pupa stage, the mosquito stops eating, much like a butterfly in its cocoon stage. Once ready, the mosquito emerges from the water and becomes an adult. The male mosquito doesn’t take blood meals; they only feed on plant juices, also known as nectar. 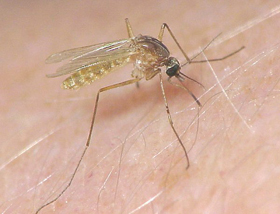 When the temperature is warm, the mosquito can develop from egg to adult in 7-10 days. During the summer, we can see mosquitoes completing their life cycles in about 5 days! This is why our vector ecologists and vector control specialists act fast to respond to service requests. Waiting a week or two can mean thousands of a new mosquitoes emerging in our communities, which can increase all of our risk of getting a vector-borne disease, like West Nile virus. Containers such as rain barrels, cans, buckets, jars, flower pots, etc. Any container that can hold water for more than seven days. Don’t raise your own mosquitoes. Get rid of containers that have or may hold standing water where mosquitoes can breed. Make sure that doors and windows have tight fitting screens to prevent mosquitoes from entering your home. Wear light-colored, long, loose clothing, such as long sleeve shirts and pants when outdoors. Keep in mind that mosquitoes can bite through thin or tight clothes. Use mosquito netting when sleeping or camping outdoors. Stay indoors between dusk and dawn when mosquitoes are most active. Apply approved insect repellent whenever you are outdoors, even for a short period of time. Choose a repellent based on duration of activity. Remember when you are sweating, physically active, or getting wet, some repellents may not last long. Our services are AT NO EXTRA COST to our residents. We do inspections and, if necessary, treatments. Contact us HERE and one of our state-certified specialists will follow-up shortly.